From 1623 to 1641 the towns in New Hampshire operated without any provincial government, but from 1641 to 1679 they were united with the Massachusetts Bay Colony. The original practice of self government appealed to residents of the New Hampshire towns and thus in 1679 they formed their own royal province with John Cutt as its president. This province lasted until 1698 when New Hampshire once again came under the jurisciiction of Massachusetts. In 1741 when King George II came to the throne, New Hampshire once again became a separate provincial government, with its own governor. Benning Wentworth was the first chief magistrate and he ruled from 1741 to 1766. His nephew John Wentwor ruled from 1767 to 1775, the very beginning of the American Revolution and the end of British provincial rule in America. The Wentworths were very popular both in America and England. They believed in the development of wilderness areas and worked very hard encouraging the settlement of the remote parts of middle and northern New Hampshire and Vermont. With the signing of the Treaty of Paris in 1762 at the end of the French and Indian Wars and the expulsion of Indians in northern New Hampshire, Vermont and Maine, the lands of northern New England were ripe for development. The Wentworths realized this and enthusiastically encouraged m ore than 30,000 families to move into the unpopulated, two million acres in northern New England. They were responsible for establishing 152 new towns in New Hampshire and 128 in what is now Vermont but which was then part of New Hampshire. The method of settling the area was logical and systematic. The land was divided into tracts and offered as a grant to an individual or groups of individuals known as proprietors.Each proprietor was free to make his own arrangement with the new settlers wishing to settle in his town. Sometimes the settlers bought tracts of land outright and sometimes they were given extensive credit. As the poor and wealthy farmers developed their property, the value of their land increased; the farmer was happy, the proprietors were happy, the provincial governor was happy and the government of England was happy. Present residents of Bethlehem financing their homes and farms may indeed be envious of their colonial forefathers, who acquired hundreds of acres of land at very easy finance terms. While most of southern New Hampshire was rapidly growing, the northern areas remained inaccessible and thus unpopulated. To change this situation, Governor Wentworth in March of 1760 employed Joseph Blanchard of Dunstable to make a survey of the Connecticut Valley from Charlestown to the lower Cohos. Blanchard and his men passed up the river on the ice and made marks on trees every six miles. The marks formed the boundaries of towns, and they took the survey as far north as Woodsville at the mouth of the Ammonoosuc. A map was made showing the course of the Connecticut River with three tiers of towns protracted back from each side. This formed the basis from which the boundaries of many northern New Hampshire towns were drawn. Part of the present shape of Bethlehem resulted from this survey. The following year, 1761, the towns of Bath, Canaan, Campton, Groton, Enfield, Lebanon, Lyman, Orford, and Rumney were chartered. In 1762 grants were given in the towns of Colebrook, Columbia and Grafton, and in 1763 the towns of Haverhill, Lancaster, Lisbon, Woodstock, Thornton, Warren, and Plymouth likewise received charters. Towns closer to our town, Benton, Landaff, Piermont, and Littleton, were chartered in 1764. While many charters were issued between 1760 and 1765, the development of the area was slow. The pioneers in our region had great difficulties developing their land. The first serious settlement in our general area was in the town of Bath in 1765. It took four years for that town to grow to 22 residents, an insufficient number to meet the terms of the grant, which was forfeited and re-issued to another group. Other towns like Lisbon and Franconia had similar problems. In 1770, five years after Bath’s settlement, Nathan Caswell moved into Littleton. In another five years the entire population of New Hampshire was 8,200 and Littleton grew to a town of 16 people. The other towns in the area had also grown: Bath had a population of 140, Lisbon 47, Landaff 40, and Franconia three families. To the north of Franconia, the town of Lancaster had 61 persons, Stratford 41, and Jefferson had four. Major forms of transportation were the rivers and crude ox wagons. Horseback travel was also a common method of transportation, for the roads could not easily accommodate wagons or stages due to their crudeness. Decades would pass before our region would be famous for its coaches. Between the towns of Littleton, Franconia and Lancaster lay an area that apparently did not appeal to the early settlers. While it had a large river flowing through its center, it was a hilly, unbroken wilderness. Granted as a township in 1774 under the name of Lloyd Hills, it was to remain in obscurity until a decade later when its first residents moved onto its land, eventually calling their town, Bethlehem. Lloyd Hills was the last of the provincial grants of Governor John Wentworth and it also was one of the last towns in our region to be settled. Granted in 1774, the charter for Lloyd Hills was followed too closely on the fires of the American Revolution to have survived. It is not known if the original charter was ever signed by Wentworth, for a copy doeS not exist, as it does for other New Hampshire towns. Since the original charter does not exist, information concerning the town’s early history is lacking. 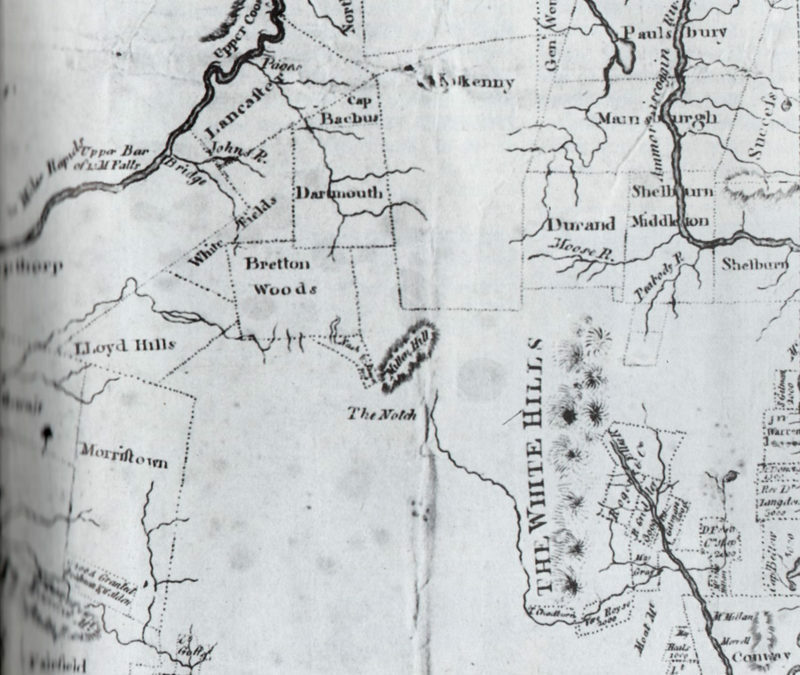 An early New Hampshire map by Holland indicates a region known as Lloyd Hills but subsequent New Hampshire maps show no listing. Furthermore, without the original charter the proprietors or first owners of our town cannot be absolutely indicated. It was probably the lack of a charter, and thus unclear legal titles to the land, that deterred the development of Lloyd Hills. James R. Jackson, in 1905, wrote in his impressive History of Littleton that Lloyd Hills was named for Byfield Lloyd, a friend of Governor Wentworth. More recently, however, the famous New Hampshire historian Elmer Hunt wrote in “New Hampshire Town Names” “The records indicate that in 1773 James Lloyd of Boston either purchased or was granted land by the proprietors in the new town of Dummer, and that another grant was made to him the following year in what was to be called Lloyd’s Hills. This tract comprised some 23,000 acres, and James Lloyd was the sole proprietor. Upon the death of James Lloyd, the New Hampshire Lloyd’s Hills grant was transferred to Commodore Loring … ” Elmer Hunt indicates that James Lloyd was Dr. James Lloyd of Boston. This would mean that Dr. Lloyd was the first and sole owner of the present town of Bethlehem.